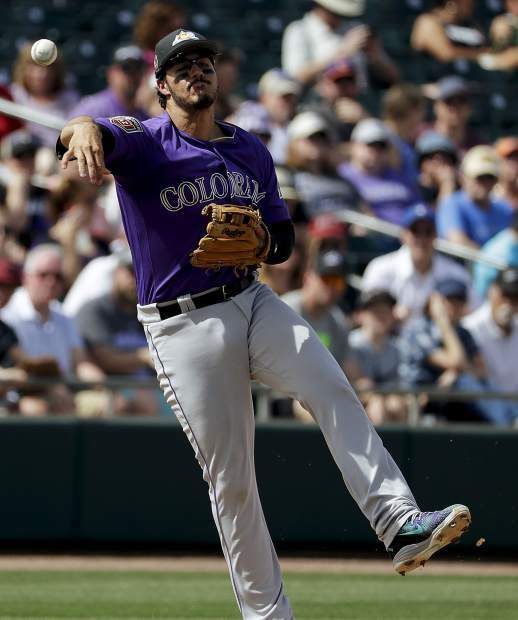 Nolan Arenado is one of the best players in baseball, but he can't pitch, and that's a major reason that the Colorado Rockies won't be making the postseason this year. As exciting as the NCAA tournament has been and the golf season looks great going into the Masters (hushed reverent tones, people), it’s time for a return to the grand ole game. Let us address the local nine first. The Colorado Rockies will not make the playoffs. The Rockies got off to a great start last year and were 47-26 on June 20, and finished 87-75. Colorado played under .500 for the second half of the season. The Rockies will hit. The Rockies have assembled a power bullpen, which is all the rage. And while baseball is full of exciting new stats, we’ll give you an old one — IP, as in innings pitched. German Marquez led Colorado starting pitchers with 162 innings pitched. That ain’t going to do it. The Rockies are either never going to get to their power bullpen or wear it down by July, the latter being the more likely scenario. Uppercut swings, the absolute result of a homer, a walk or a strikeout and the emphasis on youth are the rage. Trendy is nice, but baseball remains a fundamental game. Pitch well, play defense and hit the ball wins, all three. Los Angeles Dodgers. They have all three, which is really bleeping annoying. Clayton Kershaw is a regular-season god. (We await his postseason face plant eagerly.) The Dodgers are deep, and have the prospects to deal for the needed adjustments at the trade deadline. They win their sixth consecutive division title. The Rockies and Diamondbacks regress from last season, the Padres will be the Padres, just flat out annoying, and the Giants will be a better team than last year because it’s hard to get any worse. This is a division which exemplifies a major issue in baseball — tanking. You’ve got three teams that are competing — Cubs, Cardinals and Brewers — and two that have thrown in the towel before Opening Day — the Reds and Pirates. Since the last three World Series champions — Royals (for 30 years), Cubs and Astros — were tear-downs, it’s all the rage. The Cubs should win the storied Central Division, while one should watch St. Louis. The Cardinals have good young talent. They could give the Cubs a run. I’m iffy on the Brewers — they still lack pitching — but given that a lot of teams in the NL are tanking, they could slide into the second wild card. The Washington Nationals win by default. If the Mets are healthy — and their eternally promising staff almost never is — then they could make a run at it. But the East is just what I was talking about with baseball’s competitive balance issue. Yes, the Marlins are the poster child of tanking. The Phillies are a trendy pick, but they’re saving up their pennies for the 2018-19 free-agent market. Speaking of Bryce Harper, who hits that market after this season, this is the last call for the Nationals. Remember how they sat Stephen Strasburg during the 2012 postseason? They would be many more playoff opportunities. This franchise has still not won a postseason series since 1981 as the Montreal Expos. Let’s chill the Astros dynasty talk. They’re impressive in smiting the Dodgers in seven during the Fall Classic. It is very hard to repeat. Even with a stacked lineup and staff, there is a hangover from winning the whole thing. Please notice how the Cubs and Indians played during the first half of 2017 after being in the Series in 2016. Houston should win the division by lack of competition. The Texas Rangers and the Los Angeles Angels of Anaheim — really? — have significant pitching issues. Just don’t expect a glorious repeat. I understand that about as much as I do the Los Angeles Angels of Anaheim. The Indians have arguably been the best team in baseball the last two years. Who’s going to challenge them here? Twins? Overachieved to get a wild card last year? Royals? Trying to tank, but still got Mike Moustakas back. White Sox? In long-term tank. Tigers? Short-term tank. Yes, the Evil Empire is back — the Yankees will win the division. The bigger question for Bronx Bombers of Gary Sanchez, Aaron Judge and Giancarlo Stanton is the ability manufacture runs. We have no doubt there’ll be days of blasting teams when everything is going right and balls are flying out of the park. Can they eke out runs late in games during the postseason? Yankees and Dodgers merely to jinx them both. If I have to pick, then Cubs over Yankees.